Bryce and Vue are 3d landscape programs that can actually be used to make almost any kind of image. They are centered around scene building and rendering. Their modelling capacities are limited, but they are both able to import a wide range of 3d model formats, including Poser files. Interestingly, many of these appeared first in Bryce and then appeared in Vue versions, sometimes in a disturbingly similar way. Most of the time, they were later improved in Vue. 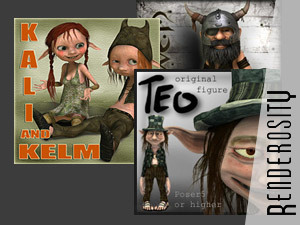 While Vue had a more or less linear development, with significant features being added with every version, the evolution of Bryce has slowed down considerably since Metacreations dropped it in December 1999. Bryce was then sold to Corel, which merely added a tree editor and other goodies to it. It was then sold to DAZ. Its new owner had to revamp its outdated code and added a few interesting features in version 6 (mainly IBL lighting). The evolution of these programs explains the fact that they now have quite different feature sets. The other big difference is the pricing and product range. Bryce is still one product while Vue is split in a whole range of different products. Historically, Bryce was more expensive than it is now. I remember paying more than $300 for Bryce 2. E-On Software raised the prices of Vue 7 (compared to Vue 6) but does occasional promotions. This price difference has to be kept in mind when comparing the features. This chart compares the features of Vue 7 Infinite and Bryce 6.1. I have chosen to compare the versions I use, rather than extrapolate on others. The chart only lists the unique features of each application. Shared features do not appear. Important features appear in red. I did not detail the animation features, as I do not know them thouroughly. Sun / moon visible in viewports. Handled like objects. You can see from the list above that Vue clearly has the edge in terms of number of features. Some of the features are very significant improvements over what Bryce can propose. But to me, Bryce still has advantages in terms of ergonomy and a nicer interface and scene preview. Vue improved its scene preview significantly in V7, adding antialiased lines for instances, but it is still not on par with Bryce in that respect.